Houzz.com has asked me to put together a series of 20 products every month that I love. How could I say no??? This month, I focused on my favorite home fragrances (all of which I use on a regular basis). Check it out here! congrats on the new gig! 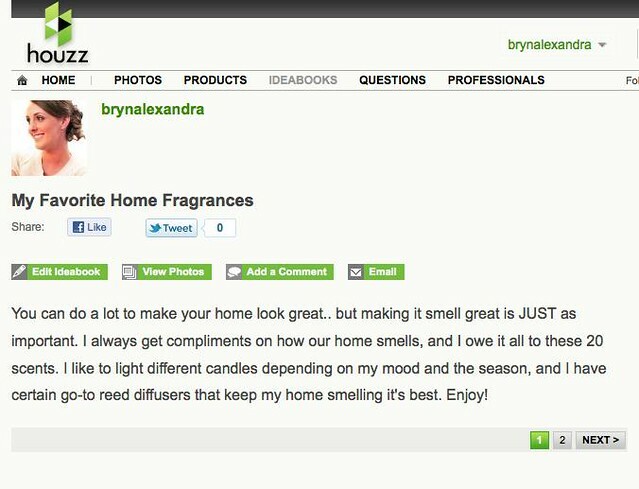 i am always on the lookout for yummy smelling house products, so i am excited about your article! it's always nice to hear about "tried and true" products...especially when it comes to home fragrance products, which can be costly. that fabric post is hilarious. I would not have known either. Love the baby holding pics! She looks good one you:) I'm doing this houzz thing too. I did space saving ideas this month. pretty fun/easy gig for people who are already image crazy right? Aspen Bay - Living Room - gardenias, rose & lilacs. Absolutely the best and will fill your home with comfort; but hard to find. Have your Mom get you one from Sample House in Plano. Tyler Candles - French Market - if you can't find the Aspen Bay candle, this will do as a sub - also has gardenias and tuberose. Yankee Candle - Sun & Sand - if you can't get to the beach, this is the next best thing. To me, it smells like Florida Sand and Sun Tan lotion (the old kind that didn't block the sun! ), but the company says it is a tropical breeze made of sweet orange flower, lemony citrus, lavender & powdery musk. I just know that one sniff and you're on the beach. Thymes - Frasier Fir - Reed Diffuser - wonderful at the holidays. Makes your whole house smell like a fresh-cut tree. I will give some of your suggestions a try! Thanks Bryn. Some new ones for you to sniff & try (my favorites):Aspen Bay - Living Room - gardenias, rose & lilacs. Absolutely the best and will fill your home with comfort; but hard to find. Have your Mom get you one from Sample House in Plano. Congrats! And wow. It's like Pinterest for sniffing! Love this! Congrats! That's wonderful. I'll look forward to your lists! This is so neat! I saw this on my houzz a couple days ago but I found your blog in a completely different way! Love all the fragrances on your list. Some made me wish I could smell them through my laptop. Ha! A couple of my very favorite home fragrances include Pottery Barn's Paperwhite, as well as Thymes Frasier Fir for winter time and Caldrea's Cypress Sage for my summertime pine fix.